Never heard of a Buckle before? Neither did I until I found a recipe for one while I was surfing the Internet. I was looking for a luscious dessert recipe that I could bring to a potluck, but I wanted one that would also be quick and easy. 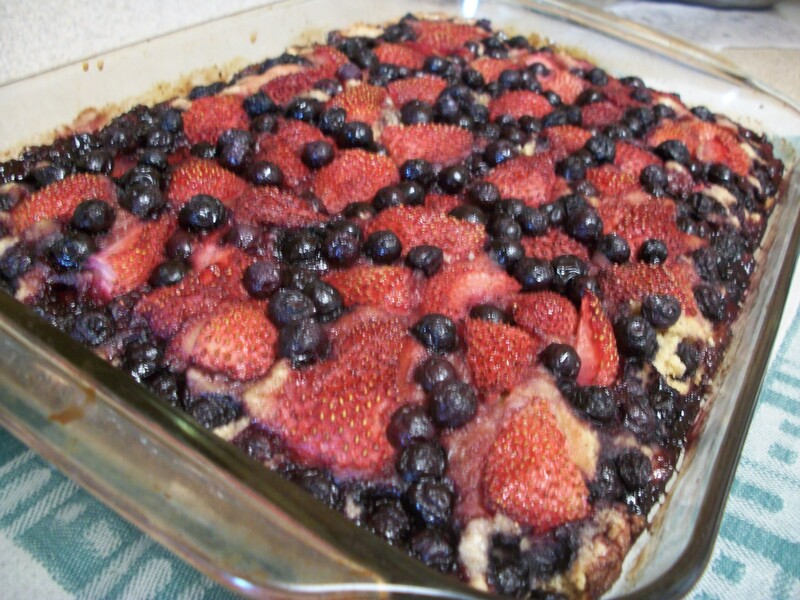 I came across a recipe for Strawberry Buckle from Nancy Fuller of Food Network's "Farmhouse Rules" and decided to create a variation of it. I used a combo of fresh strawberries and frozen blueberries. But be forewarned if you're using frozen fruit: Be sure to defrost the berries first and drain off any excess liquid--otherwise, the batter won't set. 2 cups berries, fresh or frozen. If frozen, defrost and drain well. Optional: Serve topped with vanilla ice cream. 1. Preheat oven to 375. Grease 9" x 12" baking pan. 2. Combine melted butter and sugar in a large bowl and stir until well blended. Add eggs and almond extract and mix together. 3. In another bowl, mix flour, baking powder and salt together. Add to butter-sugar mixture along with milk. Batter will be thick, but mix just until combined. 4. Spread batter evenly in greased pan. Press fruit down on top of the batter. If using fresh strawberries, half or quarter them, depending on size. 5. Bake 35-40 minutes or until toothpick inserted in center of batter comes out clean.